Pretty picturesque Porlock Weir is not really where you expect to find a takeaway / restaurant full of Eastern Promise, but walk far enough down to the quaint old harbour, and that’s exactly what you will get. Ziang’s has to be about the most surprising find yet I have discovered on Exmoor. Run by Michael Taylor and his mother Choo, the family hail originally from Brunei in South East Asia. They actually serve good old fish and chips (well we are beside the seaside aren’t we? ), but their piste De resistance is their brand of Far Eastern Food – and for what you get in the bowl, it’s actually great value for money. Its modus operandi is basically a complete meal in a bowl, and it certainly is that. I opted for the Duck Rice which came with a fried egg on top – Michael obviously picked up in the incredulous and mystified expression on my face and immediately reassured me that this is how it is done in the far East – forget your standard egg fried rice from your local chinese, a fried egg placed on top is how it is done if you want it authentic. My daughter Becky opted for the Porlock Chow Mein, but I went for the chefs recommendation – Duck Rice. He eats this dish every day apparently. Well, as soon as it arrived , I could see why! As soon as I tucked into it my mouth was hot with a glorious flavour explosion that my taste buds are not likely to forget any time soon. Now I could fish around for all kinds of Superlatives to describe the aforementioned dish but let me just say simply this: it was delicious. Lots of juicy, insanely tasty duck, mouth-watering fried vegetables on a bed of perfectly cooked white rice. And to complement the whole dish, a fried egg on top – of course. Seating? Well that’s an interesting one because there isn’t masses. There’s room for 2 or 3 inside, there’s some comfortable seating and a table right outside the hatchway or there are a couple of benches just across the way right by that ancient harbourside that is Porlock Weir. This was actually a really nice experience, enjoying far eastern delights on fine summer evening right by the harbour side – what could be better?? The combined elements of the West Somerset Coast, exotic food and a warm welcome are factors hard to beat. 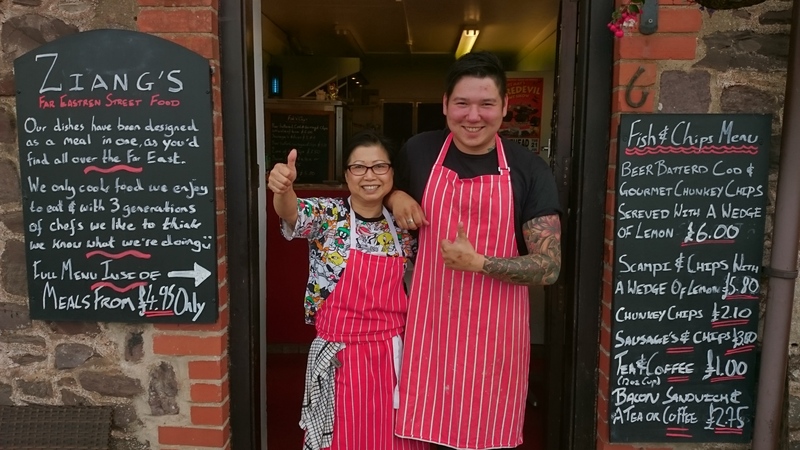 Not much more to say except you should definitely check it out if you fancy a bit of Far Eastern cuisine, right in the heart of beautiful West Somerset. The menu is extensive, drawing influence from Brunei, Thailand and Indonesia. Go and pay Michael and Choo a visit. If you like your food with an Oriental twist within a beautiful setting, you’ll love it I guarantee. Posted on Nov 13, 2015 Nov 13, 2015 by John RabyPosted in FoodTagged Exmoor, Food.